Our Green Camp location serves as the headquarters for our Energy Department's Propane division and also provides agronomy services and feed & farm supplies. With propane as Green Camp's main focus, we are ready help you with any and all questions you may have. 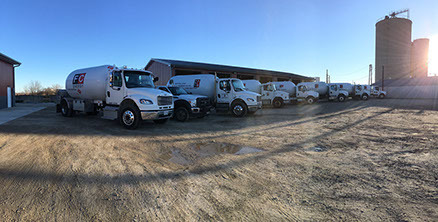 We provide propane tank-setting and refill services for commercial businesses, agricultural operations and homeowners in Central Ohio. We continuously watch the market and alert you to the best times to buy. We work with you to develop a program specific to your home or operation and offer cap-price programs that are guaranteed even when the market soars. To find out more about any of Green Camp's services click on the division links for in depth details. FOR PROPANE, CALL US AT 1 800 HEAT GAS.